The 15 Most Stunning Sapphire Engagement Rings You'll Ever See! The 15 Most Stunning Sapphire Engagement Rings You’ll Ever See! These 15 stunning sapphire engagement rings encompass a 150 year timespan and are simply incredible. From Victorian halo style rings to modern creations, these sapphire engagement rings are a small sample of our collection and have to be seen to be believed! This incredible cushion cut sapphire engagement ring is from the art deco period and is absolutely striking! Classic shapes and an amazing contrast of color. This jaw dropping 7.5 carat sapphire is from another world. 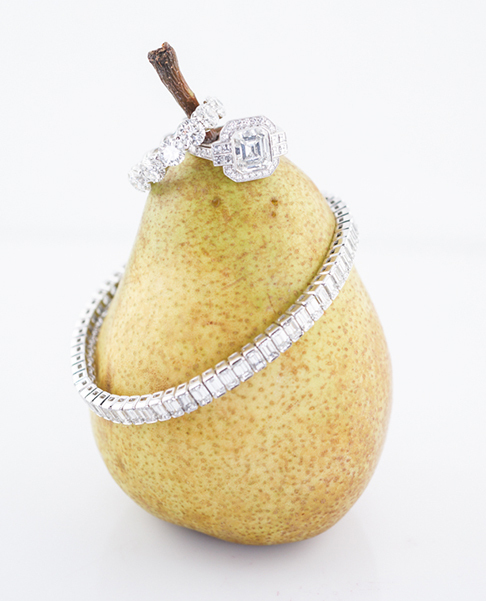 Encircled by 2.40 carats of diamonds, this design is completely enchanting! This original vintage three stone art deco engagement ring has a bold look! Two old European cut diamonds flank the center sapphire creating a gorgeous contrast of color. This oval cut sapphire engagement ring is striking! Trapezoid cut diamond accent the intense center sapphire and add a pop of sparkle with every turn of the hand. Love vintage and unique? This Edwardian sapphire engagement ring is simply sublime with a cushion cut sapphire and old European cut diamonds. This original antique art deco engagement ring features a 1.39 carat sapphire. The center stone is accented by old European cut diamonds and is bordered with incredible milgrain detailing. Considering something less ornate? This later art deco engagement ring is as timeless as they come! This Victorian engagement ring was made in the late 1800’s and is as stunning today as it was when horses were the mode of transportation! Another incredible halo style sapphire engagement ring! This over 5 carat cushion cut sapphire is out of this world gorgeous! 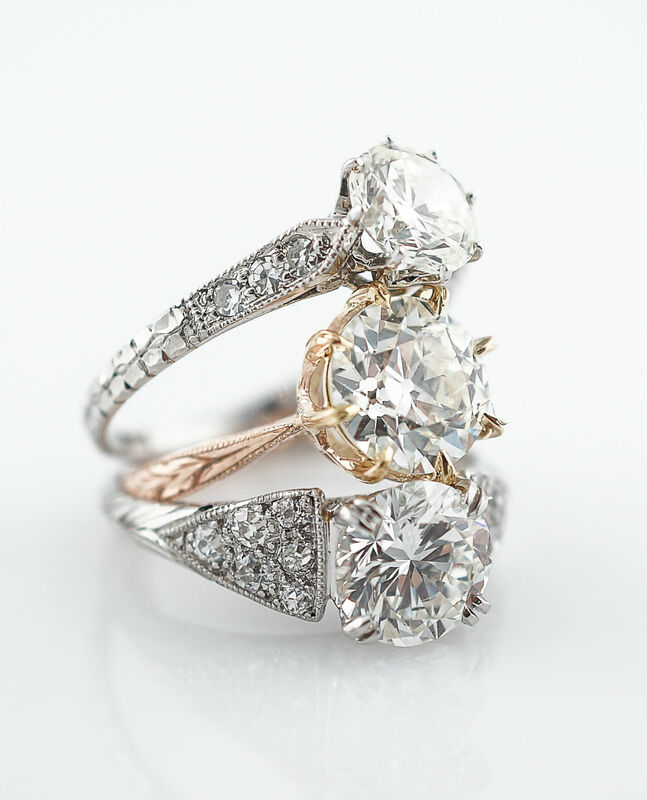 This original vintage engagement ring from the 1920’s has everything you could ever want. A cushion cut sapphire surrounded by a bed of diamonds, milgrain and negative space…simply stunning. This vintage Retro period engagement ring is a three stone style with an oval cut sapphire in the center. 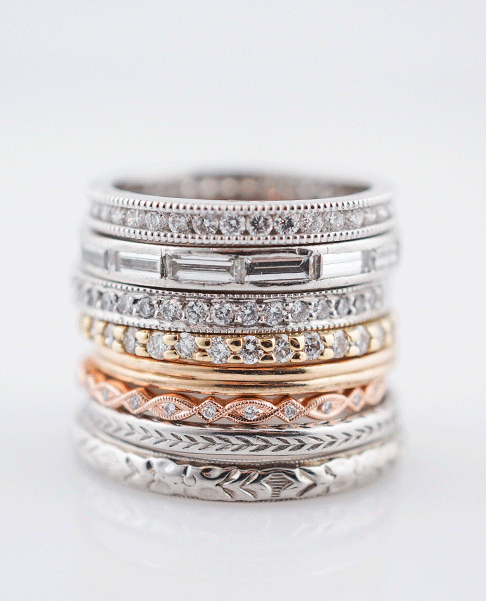 Flanked by two diamond and a mix of yellow and white gold, this vintage piece is a true classic! This original art deco engagement ring features a gorgeous solitaire sapphire in a filigree mounting. Simple and classic! An oval cut sapphire sits at the middle of the amazing art deco engagement ring. Diamonds, milgrain, and accent sapphires adorn this special ring! This original art deco engagement ring features a solitary sapphire set with square prongs. The center diamond is accented by single cut diamonds to each side that flash a bit of brilliance with every turn of the hand! This romantic Victorian engagement ring is the original halo style. A single sapphire is encircled by a halo of old cut diamonds and is simply exqusite! *Bonus! Read more about the history and lore of sapphires! This entry was posted in Art Deco Engagement Rings, Engagement Rings. Bookmark the permalink.